Something has happened and now you’re frantically googling, looking for a way to help your cat. We won’t waste words here - this could be an emergency! 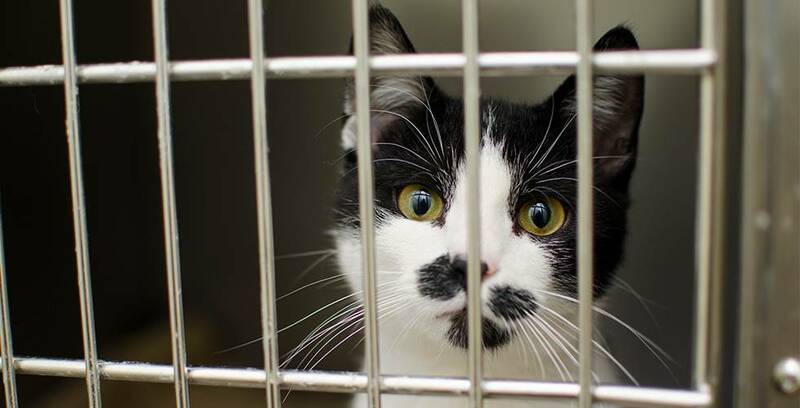 Your vet is your first port-of-call for any issues of cat health. Yes, there are certain things that you can do yourself. Yes, we have taken every care to make sure we give you reliable, accurate information. But we can’t see your cat, we can’t diagnose your cat and we definitely can’t give you professional medical advice. Keep your vets number on your fridge, in your phone and sticky taped to your cat first aid kit. Tattoo your vet’s number on your arm. Just, please, call your vet! They will know what to do - it’s what they went to university all those years for! If, for whatever reason, calling your vet is not an option, read on. A cat in distress will be very anxious and may become very aggressive when you try and help it. Be careful! This is not the gentle feline you’re used to. Approach carefully, and wrap your cat in a towel to restrain it if necessary. If you are bitten or scratched, you should see a doctor. Place your hand on your cat’s head, gripping either side of its jaw with your index finger and thumb, just below the canines. Gently tilt its head back, with nose pointing up. Squeeze your index finger and thumb together to open its mouth. Gently pull out your cat’s tongue and identify the obstruction. If it is a needle, embedded bone shard, or similar object, take your cat to the vet immediately. Otherwise, try pulling out the object with your fingers or pliers. Pick up your cat by the hind legs and dangle it upside down, shaking to try and dislodge the object. Lay your cat on its side, and put your palms behind the last rib on either side of the abdomen. Press your palms together 3 or 4 times and repeat until you dislodge the object. If you cannot clear the airway, take your cat to the vet immediately. My cat is not breathing! If you dislodge the object, but your cat is not breathing, feel for a pulse on the left side of its chest, just behind its front leg. Extend the head and neck. Holding the mouth closed, blow firmly into its nostrils, giving one breath every 3-5 seconds. Continue until there is resistance, or you see your cat breathe. Check for movement every 10 or so seconds. If your cat is still not breathing independently, take it to the vet, continuing artificial respiration on the trip over. Grip your cat’s breastbone in the palm of your hand, with your thumb on one side of its chest and your fingers on the other. Squeeze your thumb and fingers together firmly, around 2 times per second. After 30 seconds, hold your cat’s mouth closed and blow firmly into its nostrils for three seconds at a time, taking a deep breath in between. After 1 minute, stop, and check for breathing and a pulse. If your cat’s heart is still not beating, repeat steps 2 and 3. If your cat’s heart is beating, repeat step 3. If the process has not worked, take your cat to the vet immediately, continuing these steps. If your cat was struck by a car, you should take it to the vet, even if it appears unhurt - internal injuries can be invisible yet severe. In the future, we recommend keeping your cat inside or in a secure outdoor enclosure. Again, beware of internal injuries and take your cat to the vet. Put on a tight, compression bandage until the wound is covered and not seeping through. Go to the vet immediately. Do not put sticky adhesive on your cat’s fur. If the bleeding was the result of a cat fight, you should get your cat tested for FIV and other potential diseases. Keep your cat in a secure outdoor enclosure to minimise this risk. Do not attempt to treat this yourself, as you may cause additional injury. Put your cat in a padded cat carrier, or similar, and take them directly to the vet. Run cold water over any burns for at least five minutes, then contact your vet. Do not use human ointments or creams, although you can try covering the wound with saline-soaked gauze. If your cat has ingested poison, or a toxic plant, try and identify it and contact your vet. Call your vet immediately and do not try to make your cat vomit unless instructed. 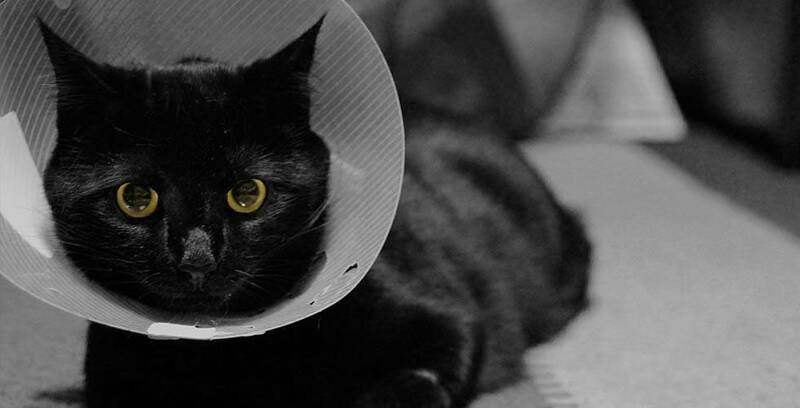 Stop your cat from ingesting it by using an Elizabethan collar (commonly known as ‘the cone of shame’). You can try clipping the affected areas, but do not use paint remover or turpentine. Contact your vet. Again, use an Elizabethan collar. This will prevent your cat from pawing at the wound and making it worse. You may try flushing the eye with water. And, of course, call your vet. If your cat has been shocked, be careful in touching it - turn off all power in your home first. If this is not possible, use a dry, non-conductor (like a wooden broom handle) to push the cat away from the power source. Give resuscitation as above if necessary. Contact your vet. Pull out the sting from the base, avoiding the poison sac. For a bee sting, use an alkaline wash, like bicarb; for a wasp sting, use an acidic wash, like vinegar. Apply ice to reduce swelling. If the sting is in the mouth or throat, immediately contact a vet, as it may make breathing difficult. We hope you never need to use the contents of this guide, but it’s your responsibility to be prepared. Now shake it out with some adorable kitten videos!